We are examining brain development during childhood and adolescence. We are currently recruiting healthy children aged 8-13 years, who do not have braces. Participation in this study will require at least one visit to the Alberta Children's Hospital. The visit will involve a cognitive assessment and a non-invasive brain scan using magnetic resonance imaging (MRI). You may request an image of your brain to take home. White matter is one of the main components of the brain that contains myelin, an insulating material that surrounds neurons. Myelin forms a fatty layer called a myelin sheath around neurons and is important for efficient communication in the brain. It is also important during development, as increased myelination allows for higher cognitive functioning. Magnetic resonance imaging (MRI) is a non-invasive method that allows us to study the brain as it matures. Additionally, new advanced MRI techniques enable us to specifically study myelin in the brain, as the images produced using these techniques are more sensitive to myelination. The aim of this research study is to use multiple MRI techniques to determine the contributions of myelination and other specific processes to white matter maturation during healthy brain development in late childhood and adolescence. We invite healthy children aged 8-13 years to participate in our study, which is taking place at the Alberta Children’s Hospital. We hope to visualize detailed trajectories of white matter development, which will help us to describe healthy growth and to identify critical periods of maturation. In the future, this information may help physicians and researchers to identify developmental disorders earlier, possibly making treatment more effective. Characterize myelination and other specific processes observed in white matter maturation during late childhood and early adolescence (8 to 13 years). Collect cognitive function scores to aid a future project that will detail relationships between structural and functional brain development in a longitudinal study. Fig 1. This figure shows a diffusion weighted brain image. Fig 2. 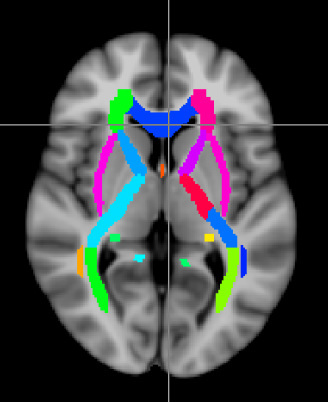 This figure shows a white matter atlas.